Police keep the protesters away from a refugee camp. David Okema. WEST NILE — Humanitarian organisations operating in refugee camps in West Nile are under pressure to fire all the non-Madi ethnic staff they have employed. The worst affected are Lutheran World Federation (LWF) and World Vision Uganda which have been forced to temporarily suspend operations and services to South Sudanese refugees who are host to the camps. According to sources from Palorinya camp, the Madi community accused the two organisation of bias in recruitment of staff. Sources told PML Daily that staffers of the two organisations have been attacked at least twice in the recent past by locals accusing them of nepotism. On Monday, a group of irate people allegedly from the Madi community in Palorinya stormed the office of LWF over the same matter. The protesters, who were chanting in their local dialect, pelted stones at the office of the LWF before they set fire to a nearby kiosk. They were shouting that LWF should give some of the jobs they claimed were taken up by “Baganda and Acholi majority in the top positions” to their own. A staffer with LWF, who preferred anonymity because of the sensitivity of the matter, told this news website last week that they woke up to a protest organised by local community against their staff. The source said the locals fell trees using power sows to block vehicle humanitarian organisation vehicles from accessing the refugee camps. On Monday morning, the angry locals reportedly held LWF staffers hostage, forcing Police to deploy in the camp. “We are behind our gate since morning, we can’t go out and our work is paralysed. We still don’t know what will happen,” the source told this website on Monday afternoon. The locals accuse the humanitarian organisations, including Lutheran World Federation and World Vision of prioritising jobs for non-residents at their expense. They say the majority of jobs have been offered to people from other areas even when their own apply for the same positions whenever advertised. The protest started against World Vision and has since spread to other organisations like LWF, Medicins San Frontieres, and Medical Team International. Operations of UNHCR were also affected. Josephine Angushia, Police spokesperson for West Nile region, at confirmed the happening, describing it as violent protest by local community. She said the locals attacked World Vision vehicles carrying relief supplies heading to the distribution point at the camp. 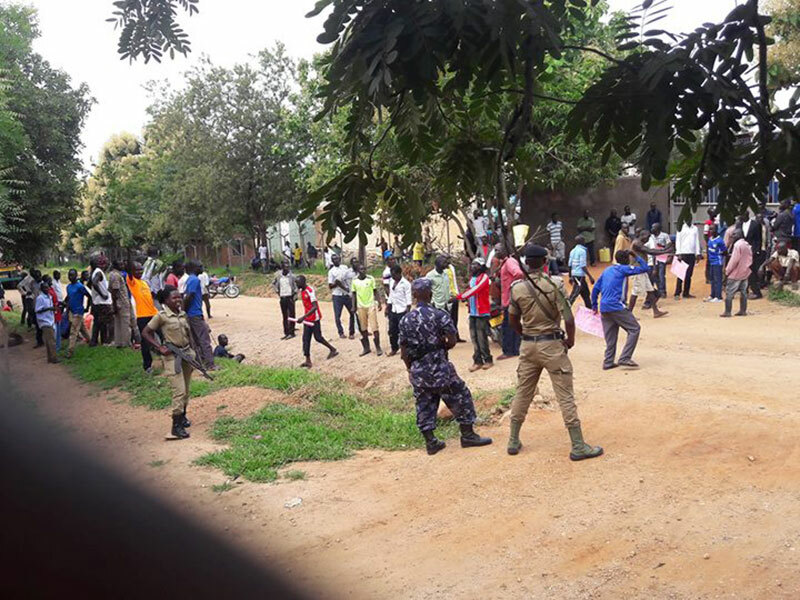 She said the protesters have destroyed a lot of property, including a shop and a several trees around Palorinya trading centre. “They claim that there is unfair employment policy by World Vision but we still don’t know if that is true,” Angushia said, adding that, besides security, Police were providing engagement role between the leaders, organisation and the youth to ensure that the situation is normalised. Agnes Kabaikya, communication officer for World Vision in Kampala, said following recent reports of unrest, World Vision West Nile Refugee Response office has made sure of the safety and security of all its staff members while continuing its urgent food assistance to serve around 170,000 refugees in Palorinya each month. Kabaikya denied the allegation that World Vision segregates the West Nile people from working by giving preference to other Ugandans. She said the organisation will continue coordinating with authorities in the district and bases its decision for the staff’s safety regardless of tribe, faith or gender. The communication officer emphasises that World Vision, which has worked in Uganda for 30 years, will maintains its impartiality on humanitarian work. Police spokesperson Angushia had urged the humanitarian organisations and the leaders to engage locals, especially the youth, with a view to changing their mindset on employment issues. She said no body was arrested but that Police have since restored calm. In 2016, a similar protest erupted at Rhino refugee camp in Arua but was handled by all parties. “There is need to select some local leader to harmonize conflict that will interrupt the work with organisation and its operation in the camps. This will create harmonious situation with the local communities so that there is coexistence, because local community wants to be part of what is happening in their areas,” Angushia said.